We offer discounted admission for field trip groups, including school groups, daycares, scouting group, and other organizations. 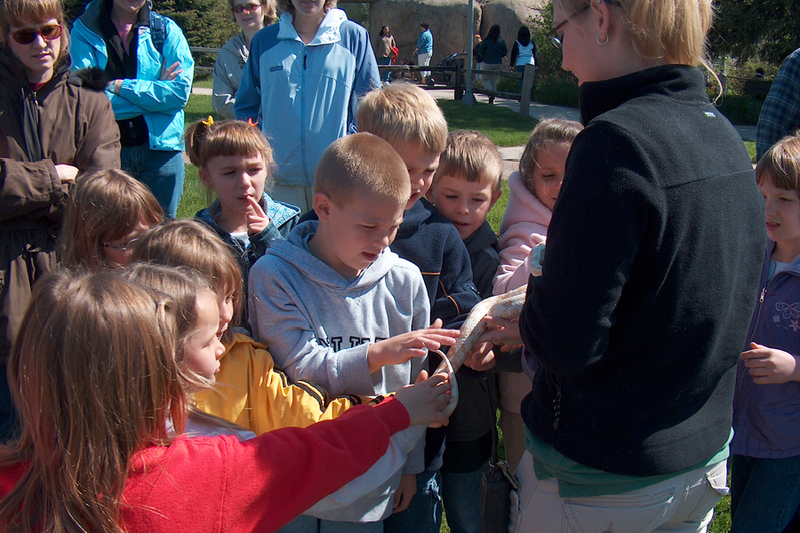 If you would like to know if your group qualifies for a field trip rate, contact us at education@racinezoo.org. A minimum group size of 20 is required for discounted field trip rates. Completed forms should be dropped off, e-mailed, faxed, or mailed. All groups coming to the Zoo must be pre-registered. All groups must request a reservation two weeks prior to arriving. A confirmation will be mailed, faxed, or e-mailed to you within 7 days after the submission of your registration form. Do not assume your field trip is confirmed if you do not receive anything from us. Please contact us if you have not received a confirmation one week after you submitted your form. Bring a copy of this confirmation on the day of the visit. Students and chaperones are $2.00 per person November through March and $4.00 per person April through October. You receive 1 free chaperone for every 8 paid students. Education programs are a great way to enhance learning at the Zoo. We offer our own themed programs, but can also create a program to tie into your curriculum or group needs. Our programs are 30-45 minutes and include four live animals. Programs must be scheduled in advance and are very popular. Please contact us for pricing and availability at education@racinezoo.org. Final numbers are due 1 week prior to your arrival, no exceptions. If we do not have a final count and your numbers change, add-ons will be charged regular Zoo admission. Please report to the admissions booth when you arrive and let them know you are here for a field trip and show them your confirmation paperwork. The admissions booth will count each student and chaperone as they walk through the gate. Payment is due at the gate. You may pay by check, cash, or credit card (Visa, MasterCard, Discover). If you are going to be late please contact us as soon as possible at 262-636-9580. There is a free Zoo parking lot one block west of the Zoo on Wisconsin Avenue. The bus may temporarily park in front of the Zoo on Main Street only for the drop-off or pick up of group passengers. Please check the weather before you depart for the Racine Zoo. The Zoo is an outdoor facility and there are no refunds once you have entered. If you need to cancel your reservation, please contact us to reschedule your visit. Bagged lunches are permitted in the Zoo. No coolers or storage areas are available for lunches during your visit. You may have your hand stamped when exiting the Zoo to retrieve your lunches from the bus to re-enter. Pre-ordered lunches are available at Max & Jenny's Jungle Grill. Picnic tables are available on a first come first serve basis and are located throughout the Zoo. A covered picnic area may be reserved for an extra fee of $50 for one hour. Please contact us for rental information and reservations. The Zoo Choo Express ride is $3.00 per person. One paid adult must accompany each car with children under the age of 13. Tickets can be purchased when you arrive at the Zoo and are non-refundable. The train runs seasonally and weather permitting. The Zootique gift shop is located at the Zoo’s entrance. Souvenirs range from $0.50 and up. We require a 1:8 ratio of adults to students in the gift shop at all times.